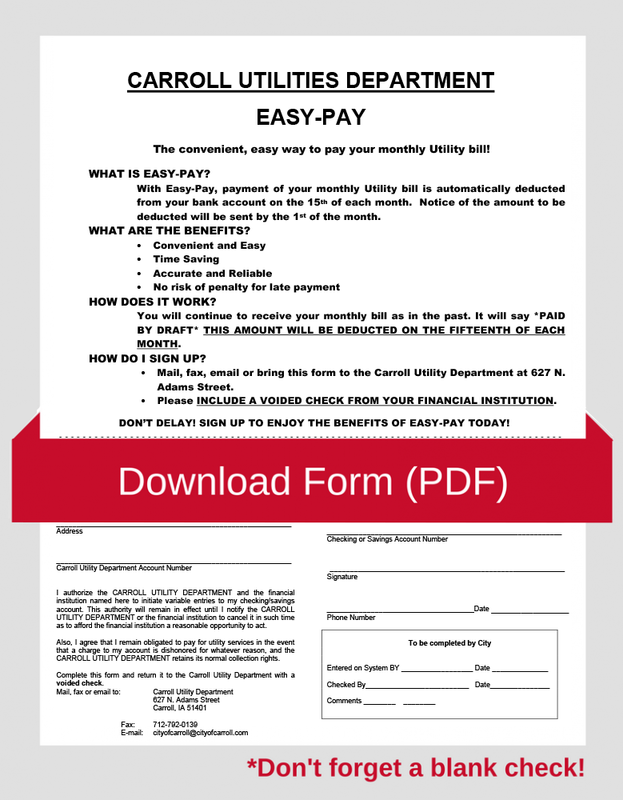 The convenient, easy way to pay your monthly utility bill! With Easy Pay, payment of your monthly utility bill is automatically deducted from your bank account on the 15th of each month. Notice of the amount to be deducted will be sent by the 1st of the month. You will continue to receive your monthly bill as in the past. It will say: *PAID BY DRAFT*. This amount will be deducted on the fifteenth of each month. Mail or bring this form to the Carroll Utility Department at 112 E. 5th Street or Call 792-1000. Please include a voided check from your financial institution. Want to receive your monthly utility bill via email? Sign up here.